In 1901, this part is listed as a "Knot of string", and this was a natural colour. It soon became two separate parts, the 'hank' of cord and the 'ball' of cord, both of which were supplied in outfits. By 1910/1911, the ball of cord was dropped and replaced by the 'card' of cord – a short length of string coloured blue wound on to a card former. The cord changed to black at some point (1912? ), and the card was dropped in 1913. The hank of cord remained in blue, and subsequently went through several colour changes. After the very early outfits, the cord soon became a blue colour, from around 1907 and the start of Meccano. Hanks of cord continue in this medium blue right through to 1929, when they changed to red. Balls and cards of cord, however, are found in black and a darker blue, as you can see from the table below. In the 30's, cord was in red, then dark blue, then back to red again. Other than the unexpected green cord mentioned in the "spare parts boxes" section below, cord changed to green after the war, and remained like this for 25 years. This green post-war cord is by far the most common, and consists of 12 feet of three strands of three-strand spun cotton, with the finished cord waxed. It is thinner than the contemporary stringing cord, which consists of three strands of four-strand spun cotton, and is not waxed. In the 70's, the hanks of cord became significantly shorter, as you can see from the photograph above, both in total length and in 'hanked' size. After Binns Road, the cord stopped being wound in this way, and was a simple wound hank held in place with tape. These later 1980's cords can be seen in the table below. A further oddity comes in the Anniversary Blocksetting Crane set of 1999. The cord in this set is black and braided, rather like the clock kit cord. It is much more suitable than standard cord for building large cranes. The photo to the right shows the white clock kit braided cord, part number 267. Standard Meccano cord is twisted, and so it untwists and lengthens when subjected to strain. This would not be acceptable with the clock weights, and so a different cord was included in both of the clock kits. It's not actually part 40, though. Strange stiff black cord, probably French? Here's a new one on me -- a strangely stiffer black cord, folded and taped like the 80's French hanks. Much thinner and stiffer than standard cord, does anyone know where this comes from, and where it goes in the table? Hanks of cord in boxes of a dozen. The photo to the right shows the standard post-war box for the hanks of cord, boxed in dozens. You might assume these are somewhat rare, but there are a lot more about than one might think, due to a large quantity being sold several years ago. What is more unusual is the green hanks of cord packed in a brown paper package. This package might be pre-war, with the scalloped sticker, and contains green cord of a slightly thicker type. Pre-war cord is generally considered to have been mostly red (to go with the small red parts?). 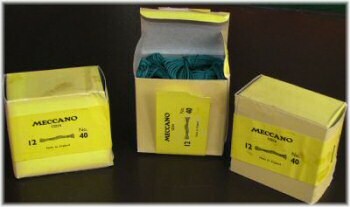 However, if export outfits had medium green strips between 1934 and 1941, perhaps they had export green cord too? Hank of cord (green) Thicker, pre-war? The stiff black string/cord secured with clear tape looks like the stuff that appears in later (post-Binns Rd) Special Edition outfits. Just putting back together a hardly used 1955 set 6 and the string lentgh is 14'? 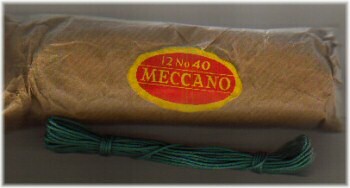 I found a thicker type green hank of cord in a 1947 No 4 outfit for the UK, so this cord was also used in a short period after the War. I acquired a number of meccano sets between 1938 and 1943 (when it went off the market) adding accessory outfits to rise from No 2 to No 6. All the string was blue, even the string fastening the parts to the box. I never saw any red string. 'There is no cure for this disease! Henry will very soon be dead!" Are all the human frame requires".